ancient Egypt from what has survived? BC AD 4000 3500 3000 2500 2000 1500 1000 500 500 1000 1500 2000 3100 BC – 1069 BC: Ancient Egypt 1666: The Great Fire of London s: The Viking Age 55 BC AD: Roman Britain Unit 10: What can we find out about ancient Egypt from what has survived? 3 Egypt What do we already know about ancient Egypt? Egypt is a country in North Africa. Click on the map to have a closer look. 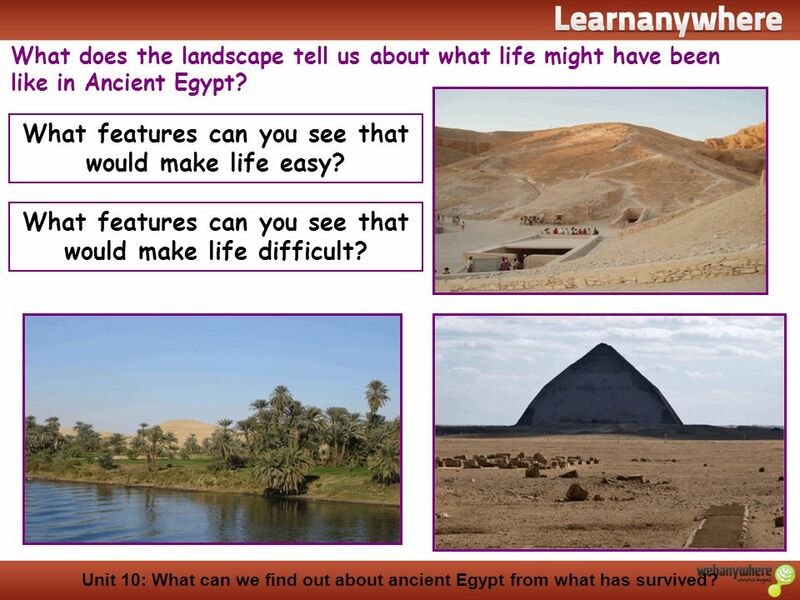 Egypt Unit 10: What can we find out about ancient Egypt from what has survived? 4 What is it made of? What shape is it? How big is it? What can we learn about ancient Egypt from one object? Choose an object or a picture of an object to study. What things do you need to think about? What is it made of? What shape is it? How big is it? What colour is it? What do you think it was used for? Where was it found? 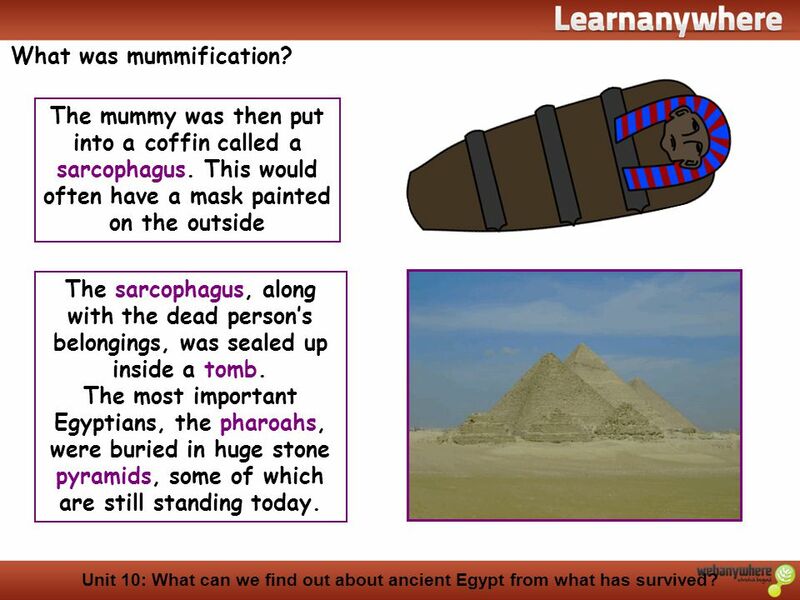 Unit 10: What can we find out about ancient Egypt from what has survived? 5 What features can you see that would make life easy? What does the landscape tell us about what life might have been like in Ancient Egypt? What features can you see that would make life easy? What features can you see that would make life difficult? 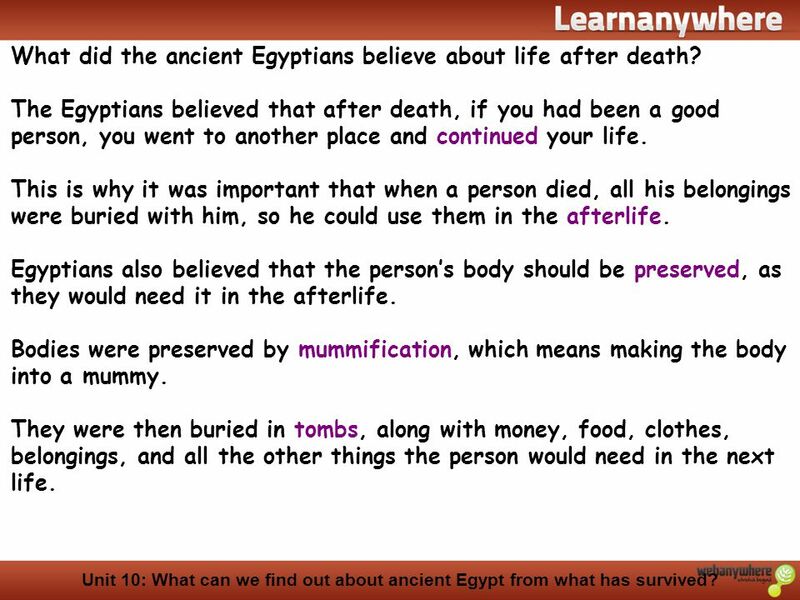 Unit 10: What can we find out about ancient Egypt from what has survived? What objects survive from the time of the ancient Egyptians? Here are some objects found in Egyptian tombs make-up container amulet necklace mirror statue playing pieces headrest Unit 10: What can we find out about ancient Egypt from what has survived? 7 What do objects that have survived tell us about ancient Egypt? This statue is called a Shabti. The Egyptians put them in tombs. They believed the Shabtis would help the dead person on their journey to the afterlife. The Egyptians loved jewellery. This necklace is made from clay beads. Richer people would have jewellery made from bronze, silver or gold. The Egyptians used mirrors which were made of bronze. The bronze was hammered flat and then polished to make it reflective. These playing pieces are from a board game called Senet which was played by Egyptians. 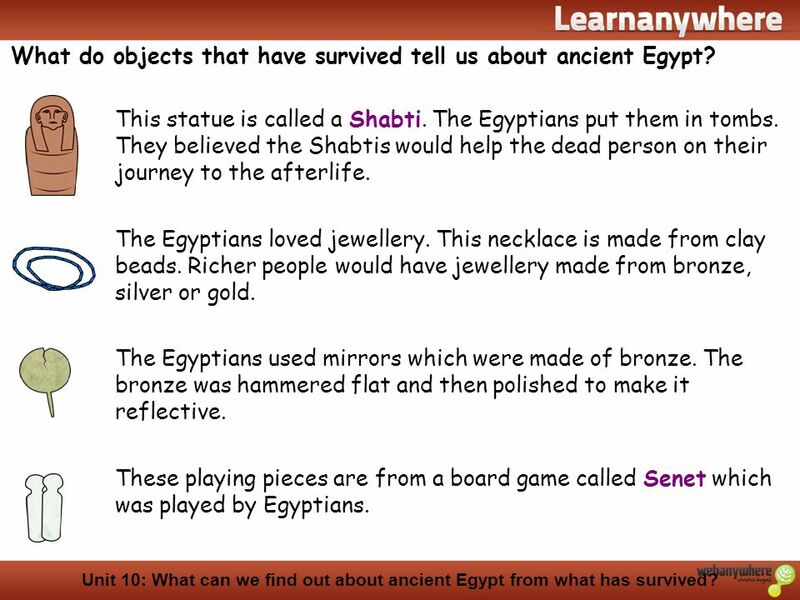 Unit 10: What can we find out about ancient Egypt from what has survived? 8 What do objects that have survived tell us about ancient Egypt? Amulets were small carvings which represented various gods. This one represents Horus. Egyptians believed that the amulets would protect them against evil spirits. This is an Egyptian make-up pot. Both men and women wore lots of make-up. As well as decorating their face, it would also protect their skin from the sun. This is a wooden head-rest. It would usually have a cloth pad on the top to make it more comfortable. These were used instead of pillows. 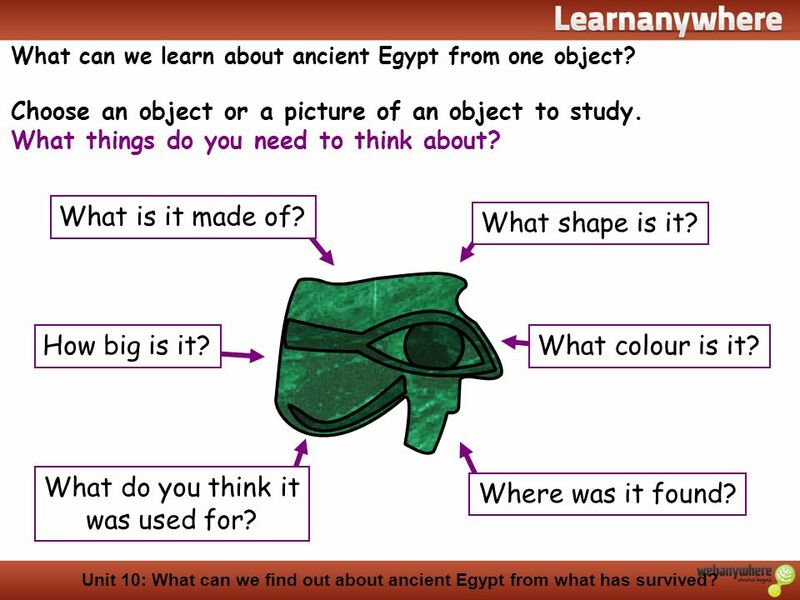 Unit 10: What can we find out about ancient Egypt from what has survived? 9 What did the ancient Egyptians believe about life after death? The Egyptians believed that after death, if you had been a good person, you went to another place and continued your life. This is why it was important that when a person died, all his belongings were buried with him, so he could use them in the afterlife. Egyptians also believed that the person’s body should be preserved, as they would need it in the afterlife. 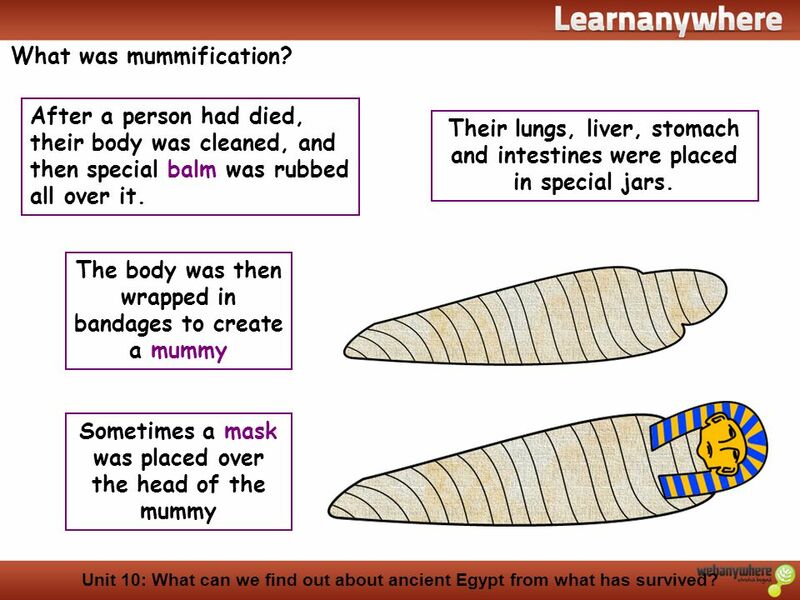 Bodies were preserved by mummification, which means making the body into a mummy. They were then buried in tombs, along with money, food, clothes, belongings, and all the other things the person would need in the next life. 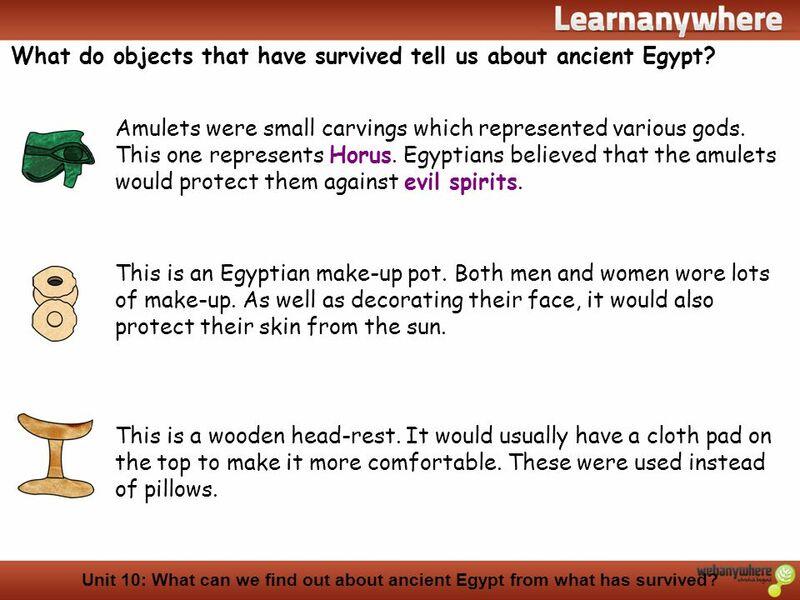 Unit 10: What can we find out about ancient Egypt from what has survived? After a person had died, their body was cleaned, and then special balm was rubbed all over it. Their lungs, liver, stomach and intestines were placed in special jars. The body was then wrapped in bandages to create a mummy Sometimes a mask was placed over the head of the mummy Unit 10: What can we find out about ancient Egypt from what has survived? The mummy was then put into a coffin called a sarcophagus. This would often have a mask painted on the outside The sarcophagus, along with the dead person’s belongings, was sealed up inside a tomb. The most important Egyptians, the pharoahs, were buried in huge stone pyramids, some of which are still standing today. 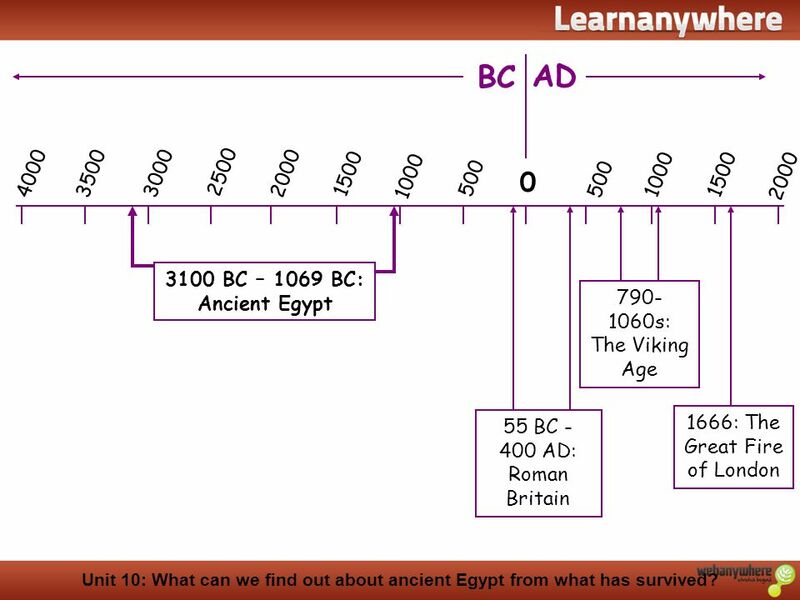 Unit 10: What can we find out about ancient Egypt from what has survived? 12 The Egyptians believed that after they died, the god of the underworld, Anubis, represented with the head of a jackal, weighed their heart against a feather of truth. Thoth, the god of wisdom with the head of an ibis would write down the result of the weighing. 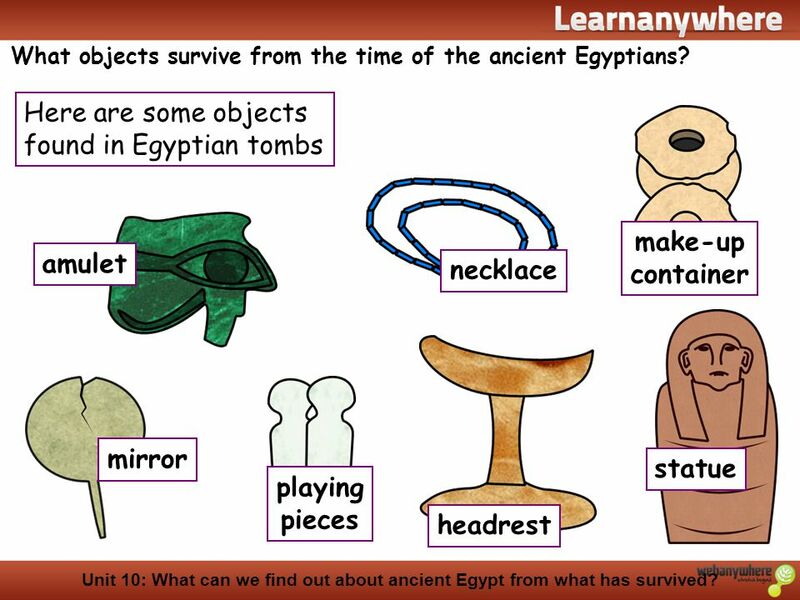 Unit 10: What can we find out about ancient Egypt from what has survived? 13 If the person’s heart was heavier than the feather, this meant that it was weighed down with all the evil the person had done in their life. 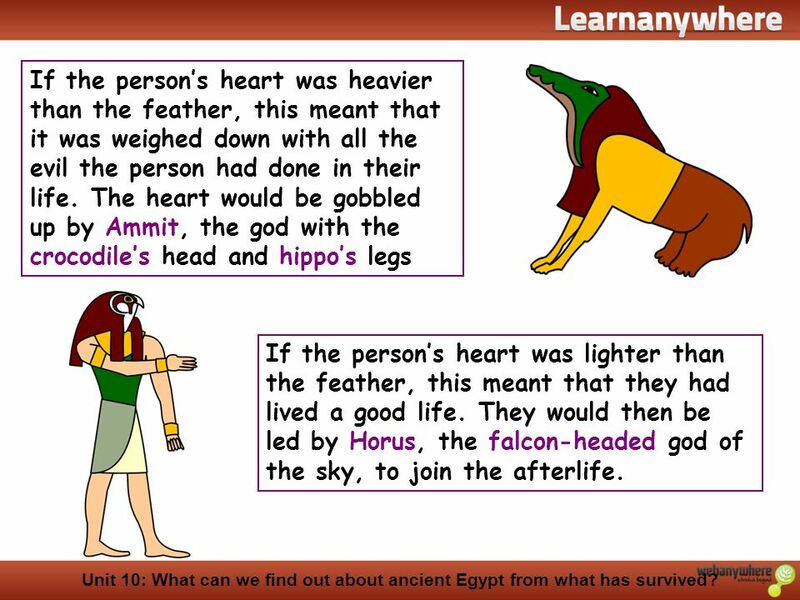 The heart would be gobbled up by Ammit, the god with the crocodile’s head and hippo’s legs If the person’s heart was lighter than the feather, this meant that they had lived a good life. They would then be led by Horus, the falcon-headed god of the sky, to join the afterlife. 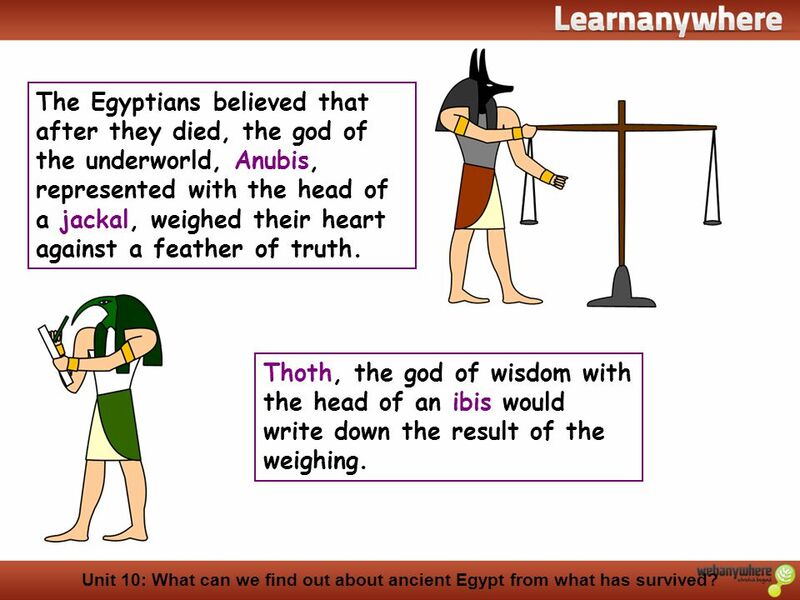 Unit 10: What can we find out about ancient Egypt from what has survived? Download ppt "Unit 10: What can we find out about"
Egyptian Canopic Jar 5th grade pottery. Egypt Egypt is a country in Northern Africa It is famous for its ancient history and mythology It is one of the. History at Key Stage 2 Unit 16: How can we find out about the Indus Valley civilisation? Unit 14: Who were the ancient Greeks? BC AD 1666: The Great Fire of London 55 BC AD: Roman Britain. Egyptian Artifacts Buried in the Pyramid. Shabti Shabit figures were statuettes, usually in the form of a mummy. Egyptians believed these would magically. Egyptian Religion Chapter 3 Section 3. Egyptian Afterlife Revealed The Process of Embalming.